Delegates take a break from sessions to watch the changing of the guard at the Main Guard, Bridgetown, Barbados. With that brief explanation, Second World War veteran Leon Watts parried and lunged, dancing over his plywood floor like an old musketeer. Canada is one of the founding members of the RCEL, along with Great Britain, Australia, New Zealand and South Africa. In 1966, The Royal Canadian Legion (RCL) took over the care of veterans and widows in need in the Caribbean. And Legionnaires right across this country give generously and faithfully. Over the last five years Legionnaires have donated $1,276,283, reaching an annual total of $315,856 in 2012. Second World War veteran Leon Watts points out the groove designed to let the blood run down the blade if you stab your enemy. Barbados is the most eastern island in the Caribbean and its total area is 430 square kilometres with 97 kilometres of coastline. It is shaped like an upside-down Africa, which is where most of the population descended from. There are nearly 290,000 people on this beautiful little island—less than the membership of the RCL. 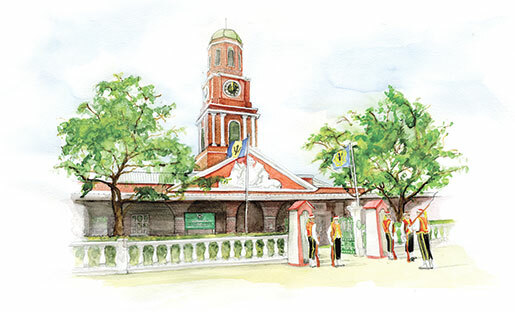 On a bright morning on Jan. 17, 2014, RCL Dominion President Gordon Moore joined delegates from seven of the 15 Caribbean nations and representatives from England at the Main Guard, Bridgetown, Barbados, a red brick British Colonial Garrison built in 1789. Fresh from their meet-and-greet event the night before, delegates got down to business. This is the first ever regional meeting, and the RCL came to discuss processes, and report back to Legionnaires on the distribution and use of funds. Moore welcomed the group and talked about the objectives of this meeting and the future of the RCEL. “The core business—distribution of RCEL welfare will reduce as the number of pre-independence ex-service men, women and widows pass away.” But the network the RCEL has built up over more than 90 years is and will continue to be invaluable for distributing funds to those in need. Service organizations, many of them military, who wish to donate to specific veterans in hard-to-reach areas can use those existing conduits. This is expected to become the majority of the League’s work over the next five years. The RCL also acts as a central co-ordinating agency for the Caribbean. On Sunday morning, Jan. 19, delegates took part in a remembrance ceremony at the Barbados Military Cemetery. Seated under ancient gnarled and burled trees, among bone-coloured gravestones and tombs, delegates bowed their heads to remember those who died and exactly why the RCEL was created. The first to place a wreath was the RCL followed by all the countries in attendance as well as Captain Lance Gill, Controller Welfare, RCEL and Brian Watkins, RCEL Honorary Legal Adviser. In the afternoon, delegates resumed their business sessions. By and large, the majority of countries meet the expectations of accountability, but RCL’s Dominion Command is providing careful oversight. If the renewal applications are not completed annually, the money will not be sent. But not every island needs or accepts welfare grants for their vets and Barbados is a good example of that along with Jamaica, the Cayman Islands and Turks and Caicos. Instead, the RCL provides poppy supplies to islands free of charge to help these countries raise funds and awareness during the remembrance period. The logistics of shipping and storing poppy supplies was front and centre in the lively discussions. Both Barbados and Jamaica stepped up with offers to store poppies for the other islands and save the RCL the cost of shipping annually. Barbados has also offered to approach the coast guard to see if there is a possibility to have the supplies delivered free of charge to the other islands. Delegates shared concerns about shrinking membership, the cost of caring for their veterans and lack of help and commitment from some of their governments. They questioned the RCL closely, looking for guidance on who can be a member of Canada’s Legion, and who is eligible to use poppy funds. Moore offered to send information on the RCL’s policies and guidelines. 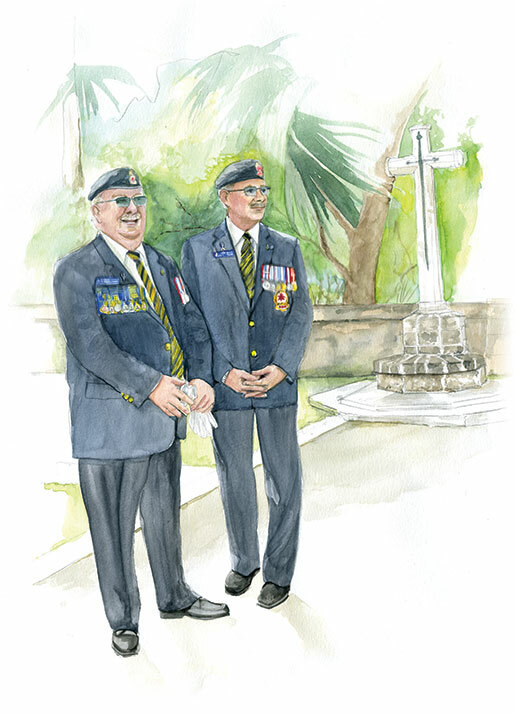 Dominion President Gordon Moore (left) and Dominion Secretary Brad White prior to placing a wreath in the Barbados Military Cemetery. Gill brought news from England. It was a busy year for the RCEL with many challenges in simply meeting the core mandate of providing a meal-a-day to the thousands and thousands of veterans and their widows worldwide. “A meal a day in India is £120 per annum ($219 CAD), in The Gambia it is £80 ($146 CAD) and in Somaliland it is £100 (182 CAD)…and the ever increasing cost of living has affected all of the countries that we support…” To put this in context, over a million dollars in grants were disbursed in India, while in the Caribbean the RCL will support 119 veterans who receive a grant of $1,080 annually and 119 widows who will receive $540 annually. In 2014, the RCL expects to spend $242,870 on individual, medical and administrative grants, as well as support for the Curphey Home in Jamaica and poppy material. There was unanimous support to meet again in 2018, between the 2016 conference scheduled for Malaysia and the conference celebrating the RCEL’s 100th anniversary which is planned for Cape Town, South Africa, in 2020. The only sticking point was where in the Caribbean that next meeting might take place. Although Barbados was willing to host again, its delegates were keen to enjoy the hospitality of another country. Antigua delegate Thomas (Beresford) Bell, agreed to look at the 2018 timeframe. 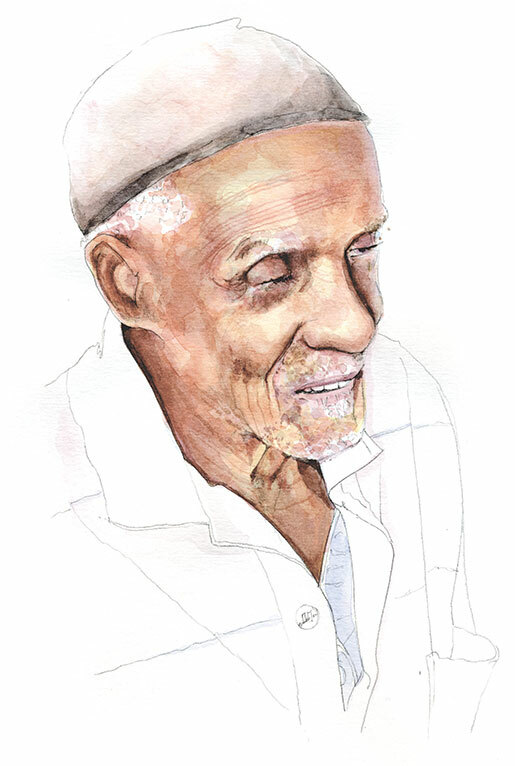 After the business and delegates had returned home, Lawrence (Carl) Forde, Chairman of the Barbados Legion Benevolent Committee, offered to drive out and visit two Second World War veterans. The narrow roads have been carved out of the porous grey coral sometimes rising nearly two metres on either side and topped with waving fields of sugar cane that helps tie the few inches of soil together and fight the erosion on this small island. Leon Fitz Stanley Watts, a wiry 91-year-old veteran met us at his chain-link gate and then guided us around debris, past cages of dogs, rabbits and birds before we entered his small wooden house in St. Michael’s Parish. “I built everyting… I cook in here, make me happy. I eat anyting at all. 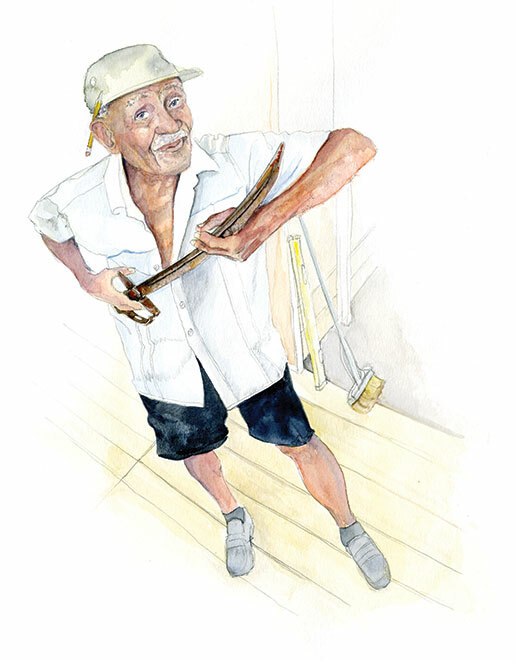 That is what caused me to live this length,” Watts explained while sliding his carpentry pencil behind his ear and gesturing around the open living space he was renovating. Watts unbuttoned his cotton shirt, tucked it behind his back into his black shorts and inhaled deeply. As the animals yipped and crowed, he slowly raised his arms and assumed a body builder’s pose. His advice, well, it is all according to how you live. “It is better to give than to ask.” He asks very little and lives an independent life. “Right, wrong or na I don’t keep no friends. De only friends I keep are de dogs and de birds and de plants.” Soon after, we shook hands and said goodbye and the old veteran went back to his carpentry. From there we drove out to see Joseph Nathaniel Bellamy in St. George Parish. He too was small, thin and neatly dressed in a white polo shirt, patterned shorts and a translucent black skull cap. 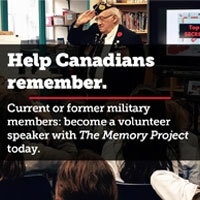 Second World War veteran Joseph Nathaniel Bellamy remembers joining the army. While the old man spoke, his hands fluttered over my fingers, hands, wrists and knees—like butterfly wings beating against my skin—even running along my pen and pad as I wrote and flipped pages. He told me he could tell exactly what a woman weighed by feeling her wrists and hands. “You are 130 pounds,” he announced triumphantly, entirely off mark. As we shook hands to leave, Bellamy said he had prayed for a visit the night before. “My prayer came true,” he smiled with pleasure.